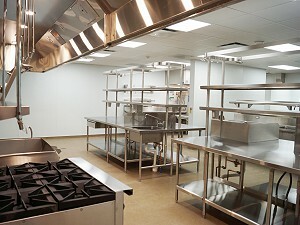 Quasius Construction recently completed the addition of a new 717 square foot, state-of-the-art kitchen, at Pine Haven Christian Communities, Giddings Avenue Campus in Sheboygan Falls. The kitchen is part of a multi-phased project to better serve its resident’s needs. The second phase of the project, which includes renovation of the lower area, including expansion of existing activity and dining area, and new community restroom facility is expected to be fully completed in Spring 2019. Pine Haven Christian Communities worked with Abacus Architects and Quasius Construction to design and construct a space that would increase kitchen efficiency and space, in addition to updating its equipment. The new space was identified after initial studies revealed that the equipment and ductwork would not fit into the existing space. 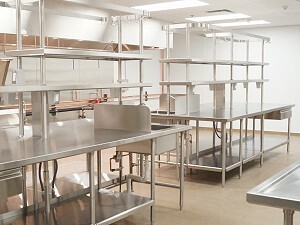 The new kitchen enhances Pine Haven Christian Communities food service operations, creating more efficiencies for deliveries and meal distribution to its residents. In addition, to the large food prep and production area, the space includes two large walk-in freezers, a new mechanical and air handling system, state-of-the-art cooking equipment. Quasius Construction worked closely with subcontractors and Pine Haven Staff to ensure residents safety and daily living were not interrupted. In addition, upon completion of the new kitchen, Quasius coordinated the move from the existing lower level kitchen to the new main floor kitchen, ensuring seamless operations. Quasius Construction is serving as the construction manager for the project, in addition to self-performing concrete, framing, drywall, demolition, masonry and rough and finish carpentry.